MILAN (AP) A visibly shaken Gianluigi Donnarumma was comforted by AC Milan teammate Leonardo Bonucci as insults poured down on the teenage goalkeeper from the fans. And that was only the warmup. Donnarumma has swiftly gone from being one of Milan’s most adored players to its most hated. After a protracted saga appeared to be settled in the offseason by Donnarumma signing a contract until 2021, speculation over his future has started again and supporters have had enough. 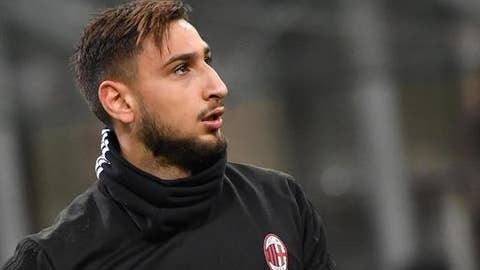 Despite the new deal being worth 6 million euros ($7 million) a year and including the signing of his older brother as Milan’s third-choice goalkeeper, Donnarumma and his agent, Mino Raiola, are reportedly looking to annul the contract because he felt pressure to agree to it. There were jeers ahead of the kick-off when the 18-year-old Donnarumma’s name was read out, and shouts for him to leave. He was in tears as he was comforted by Bonucci. Donnarumma had to play the first half below the giant banner and his every touch was greeted with boos. Milan, which is seventh in the standings, plays Verona again in Serie A on Sunday. ”Of course he’s upset, he’s only 18,” Milan coach Gennaro Gattuso said after Wednesday’s match. ”For the age that he is, there’s no doubt that he will become the best goalkeeper in the world, but he’s not calm and it can’t be easy to go out on the pitch and be criticized by your own fans. I can only say that while he is with me he will always have my total protection. It’s not the first time Donnarumma has faced insults from the stands. He had fake money thrown at him during Italy’s Under-21 European Championship opener against Denmark in June after it was announced he would not be renewing his contract, while a banner emblazoned with ”Dollarumma” was also displayed. ”We understand the fans but I ask them to boo our opponents and not our players,” Milan sporting director Massimiliano Mirabelli said. ”Gigio is a young lad and he’s not entirely at fault, he loves Milan and one day he will understand what’s good and what’s bad. Mirabelli said Milan ”has no intention of selling Donnarumma” and criticized Raiola. ”I don’t have any plans to meet with Raiola. I don’t have anything to say to him,” Mirabelli said. ”There’s a man who is trying to damage our image but he is becoming more a showman than anything else. We laugh about it, but he won’t get away with it. Donnarumma has been playing for Milan since October 2015, when he became the youngest goalkeeper to start a Serie A match, at the age of 16 years, 8 months, 6 days. He has made four senior Italy appearances and is likely to take over as the No. 1 after Gianluigi Buffon retired from international duty following the Azzurri’s failure to qualify for the 2018 World Cup.